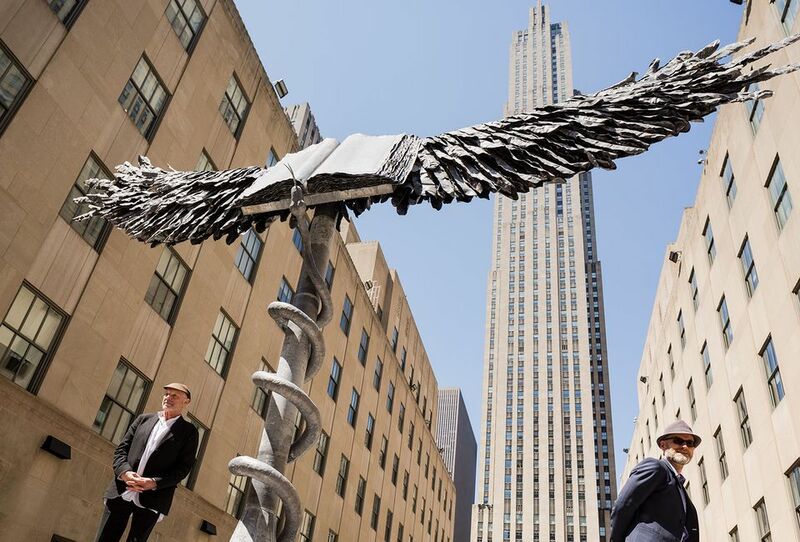 After a very long wait, May Day brought the sunny warmth of spring to New York, and a daunting public work by Anselm Kiefer to Rockefeller Center. Even in bright sunshine, Uraeus—Kiefer’s first public commission in the US—bore an uncanny resemblance to the butterflied policeman’s body strung up by Hannibal Lecter in the movie, The Silence of the Lambs. The 30-foot wingspan of a disembodied eagle spreading from either side of an enormous open book suggests as much. Forbidding though it is, the snake coiled around the book’s supporting steel column also makes the work like a physician’s caduceus, a symbol of healing. Gagosian, his gallery now, financed the current exhibition, organised by the Public Art Fund’s director Nicholas Baume. Several years ago, when Baume first approached him, Kiefer was reluctant to accept the commission. “Art needs room for itself,” he said. Public art rarely gets enough of it. But the two found the perfect site—a pier in the Hudson River, opposite the Standard Hotel. Hurricane Sandy killed that idea. Kiefer was visibly pleased with his work’s current placement at Rockefeller Center on Fifth Avenue, however, at the top of the Channel Gardens. New York skyscrapers have tantalised him since the artist’s first visit to the city in 1971, as a student. “I’ve always been a builder,” he said, recalling that, growing up in a small town in postwar Germany, his only toys were the bricks of houses destroyed by bombs. He also talked about lead, his favorite material, as the basic element of alchemical transformation. “For me, a painting is never finished,” he said. “It changes all the time.” Kind of like the New York skyline—proof that all that glitters is not gold.